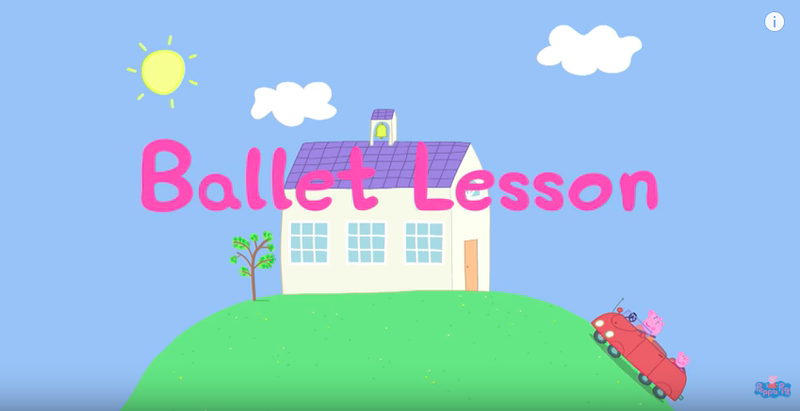 【日本語訳付き】Peppa Pig フレーズ集Ballet Lesson編 | English Culture for Kids! Mommy Pig: I’ll pick you up later. Madame Gazelle: Raise your arms. Imagine that you are beautiful swans. And what noise do you think a swan might make? Peppa: Can I show you how I did it? Daddy Pig: Mommy Pig and I used to be quite good at ballet. Narrator: Peppa is going to her first ballet lesson. This is Madame Gazelle, the ballet teacher. Madame Gazelle: Oh, you must be young Peppa. I am Madame Gazelle. Madame Gazelle: Oh so sweet. Welcome to your first lesson of the ballet. Mommy Pig: Enjoy your self. Narrator: Here are Peppa’s friends; Candy Cat, Suzy Sheep, Danny Dog, Rebecca Rabbit, and Pedro Pony. Madame Gazelle: Children, today we have a new pupil. Peppa Pig. Now Peppa run and join your friends. Madame Gazelle: Children we begin with Demi-Plies. Demi-Plies. Madame Gazelle: Now a little jump. Petit Jete. With grace and beauty. Petit Jete, grace and beauty. Narrator: The ballet lesson is a lot of fun. Madame Gazelle: Grace and beauty. 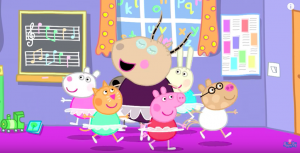 Narrator: Peppa loves dancing, everyone loves dancing. 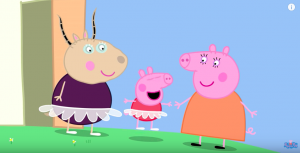 Peppa: I had to dance beautifully and gracefully. Mommy Pig: Let’s get home first. Then you can show Daddy Pig, and George, and me. Narrator: Peppa and mommy pig are home. 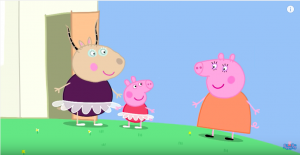 Peppa: Daddy George, I’m going to show you how to do ballet. Daddy Pig: Is it difficult? Peppa: It was easy for me, but you, George, and mommy will find it very hard. First we need music. Good. Now George, Daddy, and Mommy, you must copy what I do. Madame Gazelle used funny words, but really it’s just bending your knees and jumping. Daddy Pig: Ah the Petit Jete. 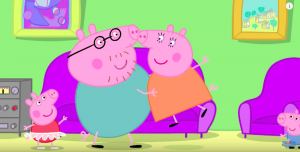 Peppa: Daddy, you know the funny words. Mommy Pig: Do be careful Daddy Pig. That wasn’t quite how I remembered it. Daddy Pig: Maybe we should leave the ballet to Peppa. Peppa: Yes, I am the best at it. I am the beautiful swan.